I do love what used to be called back in the middle of the twentieth century “walking snaps”. These candid photographs catch people unposed and unprepared. In an age when there seems to be a camera grafted into every piece of electronic equipment, this may not seem like any great achievement, we grow tired of the endless shots of us that mindlessly record every yawning second of parties we wish we hadn’t attended or drinks we wish we hadn’t imbibed. But back in the days when cameras were rare and films cost real money, people tended to be more cautious in their photographic habits and as a result happy smiling faces were the order of the day and sunny views filled each and every background. Walking snaps, however, were shot by third parties – usually itinerant seaside photographers – using their own film on snaps they may or may not sell to a passing customer. They capture real people, engaged in the business of everyday life : walking down a street, carrying a newspaper, pushing a pram, or simply checking to ensure a precious wallet is safe within a pocket. The backgrounds of such photographs are rich in detail because they have not been selected for their oft-photographed beauty, but simply because they were there. Shops, cars, streets, passers-by : all real, all caught in a moment of time and fixed forever. 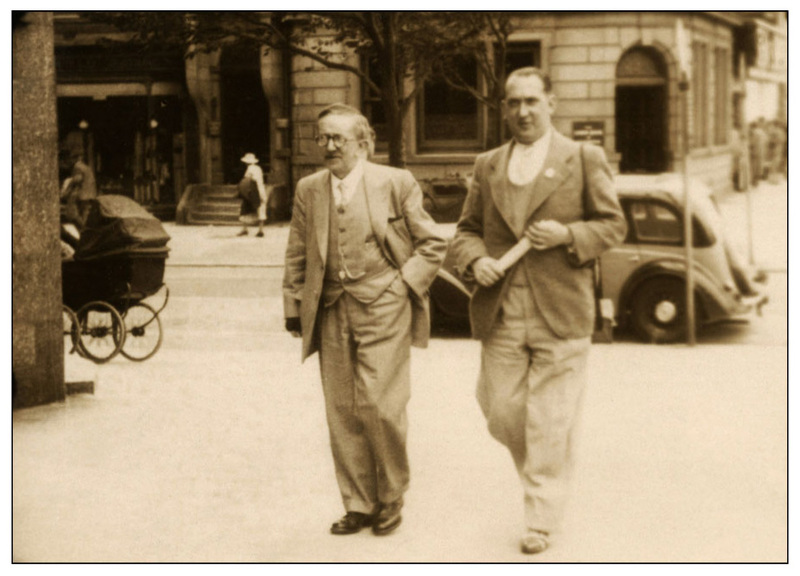 This particular “walking snap” features my Uncle, Frank Fieldhouse, with his father, Wilson Fieldhouse. I would guess they were at the seaside – Blackpool maybe or Scarborough – for such places were the territory of walking snappers. Wilson Fieldhouse worked as a railway clerk; you can easily imagine his face framed in one of those old window-tills from which they sold tickets, checking his watch and punching out the thick cardboard ticket. The date will have been sometime in the 1930s. What headlines would have appeared in that tightly-rolled newspaper Frank is carrying? Images, memories, speculations – all caught in a moment of time by the walking snapper.